What were the gas vans? How did they work? 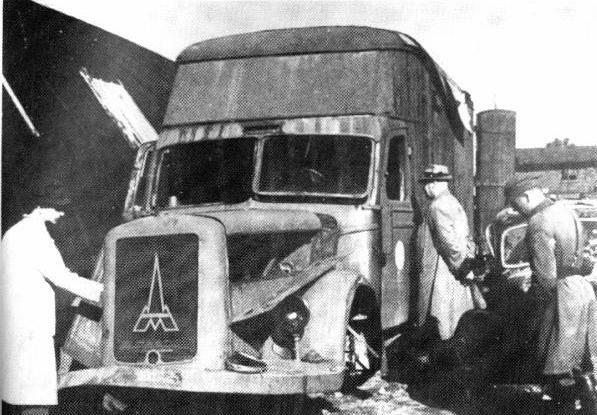 Gas vans were regular cargo trucks specially equipped with an air-tight metal cargo compartment. The exhaust system was designed so exhaust gases could be re-directed into the sealed cargo compartment, instead of flowing out the tailpipe and into the air. When the engine ran, the people locked in the back of the truck were poisoned by carbon monoxide, or suffocated due to lack of oxygen. Truck similar to gas van. Original uploader in the Russian Wikipedia was Zac Allan, and then Jaro.p [Public domain], via Wikimedia Commons. What did they look like? Gas vans were used at the Chelmno death camp in Poland and by the Einsatzgruppen in the East. Matthias Beer, “The Development of the Gas-van in the Murder of the Jews” at http://www.jewishvirtuallibrary.org/jsource/Holocaust/vans.html. Shmuel Spector, “Gas Vans,” Holocaust Encyclopedia (Macmillan, 1990), V2, p. 541. Eugen Kogon, Hermann Langbein, and Adalbert Rückerl, editors, Nazi Mass Murder: A Documentary History of the Use of Poison Gas (Yale University Press, 1993), pp. 77, 86. Santiago Alvarez and Pierre Marais, The Gas Vans: A Critical Investigation (Barnes Review, 2011), p. 351. Santiago Alvarez and Pierre Marais, The Gas Vans: A Critical Investigation (Barnes Review, 2011), pp. 351-352.